Lincoln is best known for its fine medieval cathedral, winding streets and imposing castle. 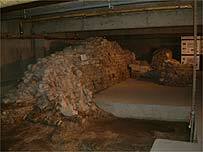 But a new study aims to promote the city's outstanding and varied Roman past. It also hopes to attract more attention to this often overlooked archaeological treasure house and help protect vulnerable monuments. Lincoln, known in Roman times as Lindum, was founded in the mid 1st century AD as the base for the ill-fated Ninth legion. This status allowed it to grow into a prosperous city, with huge walls, grand temples and impressive civic monuments. But while other Roman cities like Colchester, London and York are well known and popular, Lincoln feels its rich heritage has been overlooked. 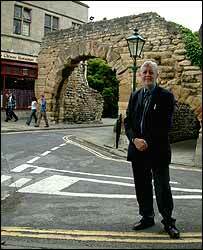 City Archaeologist Michael Jones, who has published a book on the subject, said: "It has been neglected for too long. "This city has an exciting past and uniquely important and impressive Roman heritage. "As ever this needs investment but at last we are in the process of achieving that. "We are surveying all the Roman remains and putting in place a programme of conservation and protection." This protection is not as easy as it seems. The local limestone used to build the walls and gates is relatively soft, with rain and traffic fumes battering the stone. Modern vehicles have also had a more direct impact. The Newport Arch, the largest Roman monument of its type left in Britain, was almost demolished by a lorry in 1964. Traffic still runs through what was once the north gate of the fort, the only example in the world still open to cars. The lower west gate, by the modern city hall, suffers from traffic of a different kind. Mr Jones said: "These seem to hold a fascination for kids on mountain bikes. They treat it as an assault course. "Bikes may not sound as if they are going to do too much harm to stonework but, over a period of time, something simple like pedals clipping the walls can do immense damage." The council is experimenting with a new way of protecting the remains called soft capping. This is a layer of turf which absorbs water and physical wear without damaging stonework which was a problem with the more conventional mortar capping. Along with the impressive standing remains are the hidden relics of an imperial city. Mr Jones said: "This is well demonstrated by the forum, the centre of every major Roman settlement. 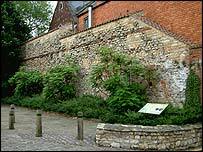 "At 6m high, the Old Mint Wall is the largest piece of civic Roman masonry left in Britain. "This was, in fact, the rear wall of the Basilica, a town hall-like structure, which was connected to a colonnaded square. "It was an expression of civic pride, the bigger the better." The columns' positions is now marked out on the modern street of Bailgate and are mistaken by most pedestrians for man-hole covers. Hidden in a cellar beneath Bank Street is the Posterngate, an entrance to the city, the stones of which have survived complete with scrape marks from the long lost door which closed every night. Even a nightclub on High Street has managed to incorporate the heating system of a bathhouse. On the aptly named Steep Hill the remains of the imposing Southern gatehouse can be glimpsed inside a shop now selling crystals. Excavations across the city have revealed far more about the Romano-British inhabitants than they were just good builders. The waterfront produced over 70 Roman shoes, remains of the animals and fish which fed the population and even the first recorded cockroach. Mr Jones said: "This was an important city, becoming the provincial capital later on in the Roman Empire. "We aim to understand it better and bring it alive for the public."